Welcome to my day on the We Support You blog. As it happens Feb.4 2015 is World Cancer Day. I doubt if there are many whose lives have not been touched by this awful illness. In March I will be a 9 year Surivor. As a survivor of Breast Cancer I entered a whole new world. I sew my way through so many things but it was difficult to choose a project for this. I had a basket of Breast Cancer fabrics picked up over the last years sitting on a shelf which has been calling me for a while. So a quilt it was to be. Very simple square in a square pattern. The top is stitched and ready for the quilter. And a cozy flannel picked for the back. I did not realize how many different prints I had accumulated. Or how many had words. Because when you are diagnosed your world seems to be fragmented into so many pieces I thought a crazy patchwork block was appropriate. We have angels among us. I figured they needed their own memory block. And for that special friend who so generously offered time, energy and especially emotional support a pillow. She has been my sounding board and always has a listening ear ready. 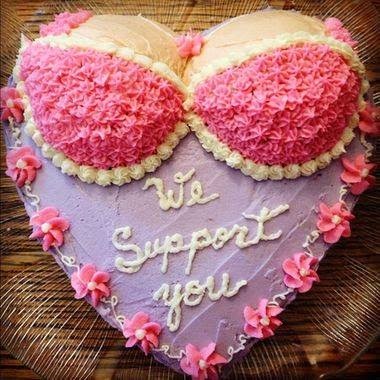 I belong to a support group for Breast Cancer Survivors. At the start of each meeting you give your name and the number of years since diagnosis. It is so powerful to hear voices say 28 years ~ 16 years 5 months ~ 6 months etc. There is so much hope offered in hearing these voices. Especially for the newly diagnosed and those starting treatment. A whole world of friends sharing wisdom. At the end of each Women Alike support meeting we form a circle, join hands and recite: " We have the power to make this day a good one." I wish you all a good day because within ourselves we have so much power. ~~~~~~~~~~~~~~~~~~~~~~~~~~~~~~~~~~~~~~~~~~~~~~~~~~~~If I was writing a letter this would be the P.S. moment. I spotted this on a Pink FB page and borrowed it. We all need a sweet moment. Your quilt is so pretty... and the mini quilt is way cool! Great idea! Fantastic fabrics for your quilt - great! Your quilt and story are so inspiring. The quilt, pillow, and mini turned out beautifully. Your sweet little heart with wings pulled on my heart strings, a great memory block. Your quilt is so pretty, I like how each block is different. Wonderful quilt, all the different blocks are perfect! The pillow is sew cute, and the wall hanging is awesome! Lovely projects and thank you for sharing your story! Beth @ Words & Stitches. Thank you for sharing your story. I hope you will stay clean and never have to deal with this illness again. I love, love, LOVE your quilt. It is absolutely gorgeous. Amazing. Thank you for sharing, and your quilt and pillow are fabulous. Fabulous quilt! Love the variety of fabrics you used from your collection. Congrats on being a 9-year survivor! Thank you for your support. Your quilt is wonderful. It makes me happy to hear your great progress as a survivor, as I am just beginning my journey. You give me great hope. Congratulations on being a cancer survivor, and your quilt is really beautiful! I love all of your projects. So much thought and time has gone into everyone's projects. I too am a Breast Cancer survivor. At this point 1 year . But Looking forward to many many more. I refuse to give up or give in..My kids depend on me and I depend on them to keep me going. Love how you used all your awareness fabrics. 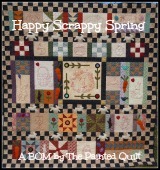 Especially the crazy quilt block...It is great you belong to such a support group. I live in a rural area. And their is no group like that around me or I would join it..Only someone who has truly walked the path understands how it changes you. always delightful to read your posts!!! fantastic projects, love your quilt! Beautiful quilt! Love the background story behind it as well. A beautiful quilt, great job on it. Your quilt is beautiful! Thanks for showing your support and I'm so glad you're a cancer survivor! your quilt is lovely kudos to being a survivor and showing your support to otehrs. Powerful post and beautiful quilt. Thanks for your inspiration. Super post! You don't post often, but when you do, you certainly pack a punch! Love your creations. Have a wonderful day. Nice job What a wonderful story and congratulations on being cancer free. Your quilt is lovely and all of your fabric fitting Thank you for sharing and your inspiration. What a gorgeous quilt! Thank you for sharing with us your journey as a,survivor! Beautiful quilt. Praying you stay cancer free. That quilt is amazing. I love all the fabrics you used, the colors blend in well and each block is so different and wonderful. Love the mini quilt to, just my cup of tea. Your quilt is fantastic! I love all of the wonderful fabrics. As a fan of crazy quilts, I was thrilled to see the crazy patch you added. And the sweet heart memory block is so touching. Congratulations on your 9 years. Just beautiful, and I do so love the crazy quilting you added to it. Congrats on your 9 years! Dear, Frances ... your story is so touching and inspiring. Sew are your projects! I do love the square in a square ... my kind of quilt. The little touches with the angel heart and the crazy quilt block are perfect. Your "Survivor" quilt is wonderful. Have you shared this with your support group? They must love it! The story of your support group and how you all stand tall as survivors offering your words of support and encouragement to those newly diagnosed is heart warming. I can feel the strength and love pouring through my computer today. Thanks for your inspiring story and great projects! Congratulations and your quilt is beautiful, my favorite block was the crazy patch. Your definition was perfect. Such a lovely post you have written. I really think your quilt turned out nice. I love all the special touches you have added, love the crazy block. Your project was created with much love and thoughtfulness. So nice to see it. Congrats on being cancer free! Love the quilt it is beautiful. You have a lot of cute fabrics in there. Cute pillow too. I wish I could eat some of that cake right now LOL. Congratulations on being a Survivor. Thank you sew very much for Supporting and hopping. Your quilt and pillow are wonderful. The power of Support like in your group is such a Blessing. Frances, Congrats, congrats, congrats. I didn't know there are support groups for survivors. At my church there used to be a cancer support group for all cancer patients and survivors. Now it is just for people who currently have cancer. I don't know why. I, too, have lots of breast cancer fabric and haven't done a thing with it, yet. Thanks for sharing your wonderful quilt and pillow. The cake is perfect. Great job! What a beautiful quilt. All the loving, encouraging words and the soft comforting colors. Wonderful. Such a nice post and sweet quilt. Thank you for your words. Lovely quilt!! Thanks for sharing. You made a beautiful and thoughtful quilt. Congratulations on your 9 years! That's an absolute outstanding quilt. I'm a pink girl so the color was perfect. All those fabrics you've been collecting certainly are well used in the quilt. The crazy quilting was such a nice touch. I'm so glad that you're a survivor. Sweet cake! Support the cause and the girls! Beautiful quilt and a beautiful story. Heres to many, many more years. Such beautiful projects! Yummy cake! I love the relationship of the pattern to the dreadful "c" word. Just perfect and a perfect looking quilt. Wish I had a piece of that cake. It looks yummy.